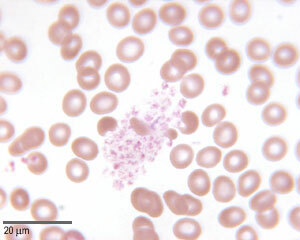 This is a photo of platelets in a blood smear. The platelets are smaller than red blood cells (around 1.5 to 4.5 µm in diameter). Platelets do not have a nucleus, but do contain mitochondria, a microtubular and actin cytoskeleton, glycogen granules, some Golgi and ribosomes. Platelets are not true cells, but are in fact cytoplasmic fragments from large celsl found in the bone marrow, called magakaryocytes. There are around 150 to 400 thousand platelets in a millilitre of blood, and the are essential for haemostasis. They adhere to collagenous tissue at the edges of wounds to form plugs, helping to seal the wound. They also promote the formation of clots, and secrete factors involved in vascular repair. Platelets are involved in haemostasis. Which major organelle(s) do they lack?